shrimpoluminescence (SHRIMP-oh-loom-in-ESS-ens) — noun: sonoluminscence — that is, the emission of short bursts of light from imploding, sound-agitated bubbles — caused by the pistol shrimp or mantis shrimp. According to Discover magazine’s blog Not Exactly Rocket Science, one sea creature has a left hook mean enough to destroy even the toughest mollusk shells and crustacean exoskeletons: the mantis shrimp. Bruiser reputation notwithstanding, it looks like the offspring of a Chinese parade dragon and that gay lobster that the B-52s once sang about. So a real-life hadouken, more or less. Now hold on: My analogy is actually less stupid than you might think. 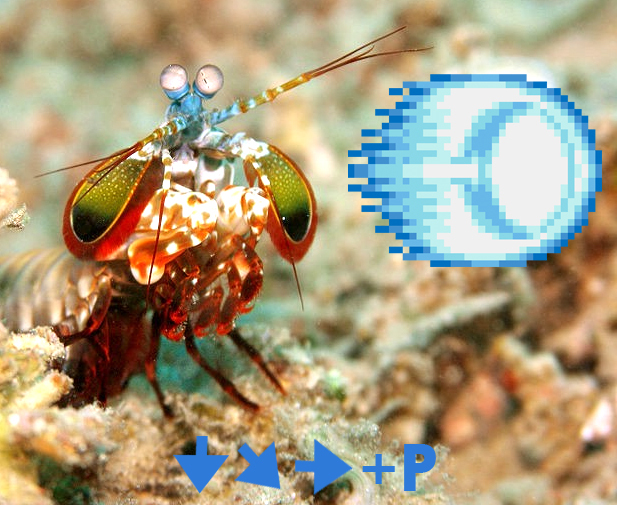 According to Wikipedia, the shimpoluminescent attack allows the mantis shrimp to further damage its opponent without physically touching it. The collapse of these cavitation bubbles produces measurable forces on their prey in addition to the instantaneous forces of 1,500 newtons that are caused by the impact of the appendage against the striking surface, which means that the prey is hit twice by a single strike — first by the claw and then by the collapsing cavitation bubbles that immediately follow. Even if the initial strike misses the prey, the resulting shock wave can be enough to kill or stun the prey. The snap can also produce sonoluminescence from the collapsing bubble. This will produce a very small amount of light and high temperatures in the range of several thousand kelvins within the collapsing bubble, although both the light and high temperatures are too weak and short-lived to be detected without advanced scientific equipment. And yes, in case you’re wondering: Mantis shrimp can break through aquarium glass — in a single strike, no less. You neglect to mention that the word "shrimpoluminescence" was initially made up while discussing the pistol shrimp and not the mantis shrimp. I did! 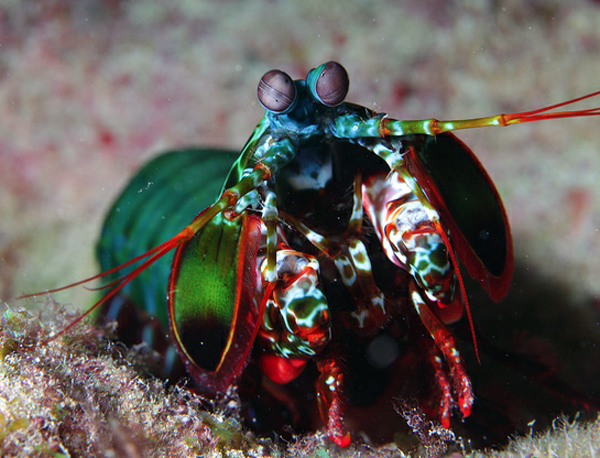 But only because the pistol shrimp seemed less interesting than the hard-punching mantis shrimp did.